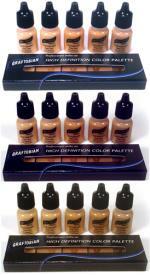 Walk-Around™ Airbrush System by Graftobian is dual voltage so you can use it and plug it in anywhere in the world. You have 3 adapter plugs that can be attached to the electrical cord for either direct plug in, OR, for battery pack charging (EU, UK and Australian style plug adapters). 1) Whether you are using the unit while plugged in to the wall or out in the field operating on battery pack power, the operation is the same. Pressure is regulated using the “Bleeder Valve” knob adjust on the bleeder valve stem that is to be attached at the bottom of your airbrush as shown on the attached image. While the power button on the unit is clicked on, it is important to always allow at least a little airflow through the airbrush at all times or else your compressor will work too hard and will not last as long as it should. You will hear the difference in the compressor if you adjust the bleeder valve to close completely as it will clearly make more noise and will heat up before too long. Again, don’t do that! Adjust the bleeder valve to the point where you feel a light flow of air coming out of the front of the airbrush at all times but not so much that the airflow would dent your skin when the airbrush is pointed at it. 2) To operate the airbrush, simply drip a few drops of the airbrush makeup into the open cup on the top of your airbrush, click the white on/off switch in, point the brush in the direction you wish to color and pull gently back on the lever on top of the airbrush using your index fingertip. 3) Apply GlamAire™ Beauty Makeup in very light coats to build color until desired tones are achieved. Use small circular motions with the airbrush tip as you pull back the lever very slightly. It is best to begin with a few practice exercises on a sheet of absorbent white paper to get the hang of hitting what you’re shooting at. Typically, the airbrush tip is held 6” or so from the skin surface. You should practice varying the distance from which you spray as well as holding the distance steady while varying the amount you pull back on the lever. You will note that both variances are ways to control the amount of product that hits the skin per second of operation. 4) Apply F/X Aire™ Airbrush Makeup in the same manner; nearly instant drying of the F/X Aire™ does allow one to lay down color more rapidly. Never spray so fast or so heavily that the makeup appears wet upon contact. This will reduce adhesion and therefore durability of your makeup. For best results, apply Graftobian Airbrush makeups to clean, dry skin. The 20045GA Glamour Walk-Around System includes all three of our HD Sampler Packs, in Cool, Neutral and Warm shades (Value $125.97).